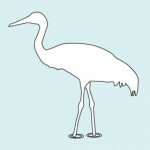 Description: The adult Whooping Crane, male or female, is white with a red crown and long, dark, pointed bill. They have black wing tips that are visible while in flight. Juveniles are white, with a brown or cinnamon appearance. The species stands at about 5 feet (1.5 meters) tall with a wingspan of about 7.5 feet (2.3 meters). In flight, their legs trail behind while their neck is kept straight. Behavior: Their behavior during courtship is entertaining to observe. They perform an elaborate dance with leaps, sweeps, bowing, head tosses, stick or grass tossing and wing flaps. This dancing is commonly associated with courtship, however it is generally believed to be a normal part of development for cranes. Mated pairs engage in unison calling, which is a complex and extended series of calls coordinated between the members of the pair. The call is a very distinct “whooping” sound that gives the species its name. Typically, Whooping Cranes migrate in small groups or in family groups (5 or more with more than one generation). 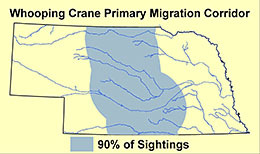 They are known to roost and forage with the migrating Sandhill Cranes in Nebraska along the Platte River; however, they do not stay as long as the Sandhill Crane. Habitat: During migration through Nebraska, they forage in cropfields, playa wetlands, and wet meadows. They roost in large playa wetlands, sandbars, and shallow river channels. 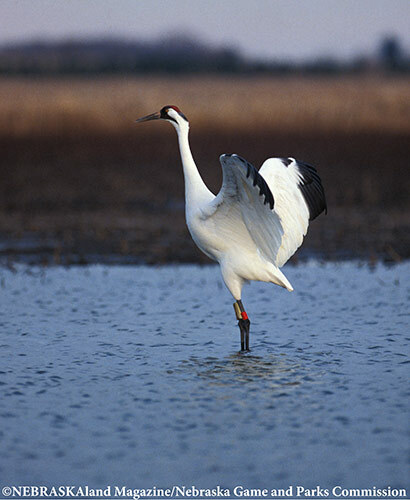 Whooping Cranes prefer open areas with long sight lines. Food: They eat a wide variety of plant and animal matter, including mollusks, crustaceans, insects, fish, frogs and waste grain (such as corn). While feeding, they peck, probe and stab their food with their bill. 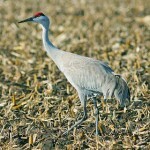 Where in Nebraska: Rare, but regular spring and fall migration. Most often found along the central Platte River near Kearney and Grand Island, western Rainwater Basins, Central Table Playas (i.e. Custer County), and Loup and Niobrara Rivers. 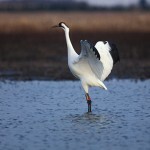 The Whooping Crane is the largest bird in North America. Only 16 individuals remained in 1941; today there are less than 300 birds in the world population. The breeding ground in remote northern Canada was accidentally discovered in 1954 by a fire crew flying over what is now Wood Buffalo National Park. Whooping Crane fossils date the species back at least several million years to the Pleistocene. The Hastings Museum of Natural and Cultural History (Hastings, NE) has the world’s largest display of mounted Whooping Cranes.